In our family, we call our daughter the Weather Girl. She has so many weather apps on her phone she could be doing reports for the local TV stations. If I ever need to know the dew point or when the moon will rise, she's the go-to gal. But my daily weather information needs are not very complicated. I like to know the current temperature and the predicted conditions for later in the day and what I should expect for the rest of the week. On my Android phone, the aptly-named Little Weather App fills that need nicely. 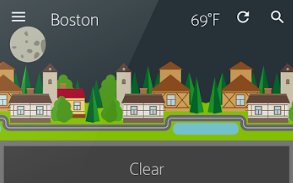 When I open the app, I see my location and current temperature displayed in a nicely-drawn streetscape graphic that changes with weather. The little town is a lot like life: Sometimes you get a big yellow sun, sometimes you get dark clouds and raindrops. 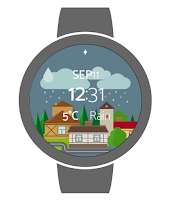 The scene can also be used as a face for an Android Watch, adding the current temperature and conditions to the time and date. As you scroll down the display on a phone or tablet, the app offers more details, including the “feels like” temperature, humidity level, air pressure, wind speed and direction and the precipitation chances. A chart shows readings from the past 24 hours for temperature, windspeed and precipitation, depending on which button you press. I usually bypass that stuff and go directly to the hourly forecast. I want to know how much I will sweat if I plan to play tennis at 2 p.m. or whether the predicted rain will hold off until after my evening dog walk. The Little Weather App shows predicted temps for each hour and a graphic to indicate if it I should expect rain or just cloudy skies. The weekly forecast is displayed in similar fashion with the predicted high and low temperature and conditions. The app uses data from Forecast.io, which aggregates data from more than a dozen sources, NOAA’s forecasts in the US and METAR forecasts used by pilots around the world. 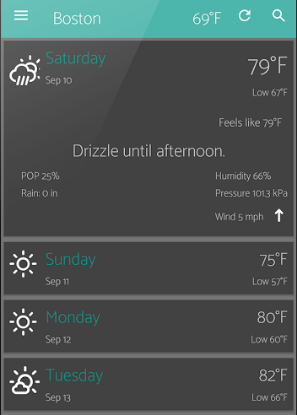 The Little Weather App is a free app, so you can expect to see a small add on most pages. 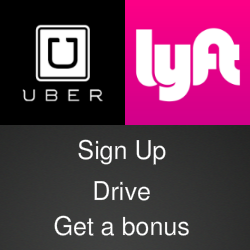 It’s available for Android devices in the Google Play Store. The app’s developer, John Carpenter, has a portfolio of his other Android projects on his 2Lines Software website and you can follow him @johncarpenter on Twitter.